About :: Vivacitas Oncology, Inc.
Vivacitas was co-founded in 2015 by Dr. Rubinfeld with an eye toward re-designing well known chemotherapies that have already been demonstrated to have beneficial effects, but which may also possess potency, toxicity, stability and/or pharmacokinetic issues that limit their use. To this end, the Company has been laser-focused on acquiring its 3 mature pipeline assets, made possible by leveraging the extraordinary professional network that 'Dr. Joe' fostered over a lifetime in the industry. As a result, Vivacitas was able to complete the acquisitions of its 3 major programs within a 12-month period. 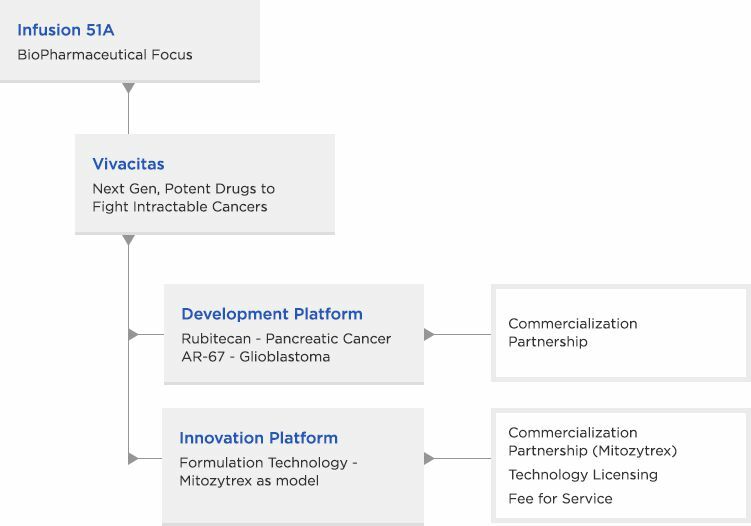 Contributing to the impressive asset acquisition track record is Vivacitas' close partnership with International Infusion Advisors, LLC via its investment arm, Infusion 51A, a relationship that is anchored in a common mission - to develop disruptive technologies aimed at improving the quality of life of cancer patients. The Innovation Platform is focused on applying new formulations and modified chemistries to compounds having efficacious properties that are overshadowed by problematic characteristics. Mitozytrex, a re-formulated version of Mitomycin C, is the exemplar in this Platform. Vivacitas' intention is to bring its programs through later stage clinical development to the point of Phase III completion and NDA submission, and will seek experienced bio/pharmaceutical partners to commercialize the products. To this end, the Company enjoys an unusually rich pipeline of post-Phase II assets that are positioned to return both near- and long-term value to patients and their families, as well as our visionary stakeholders.